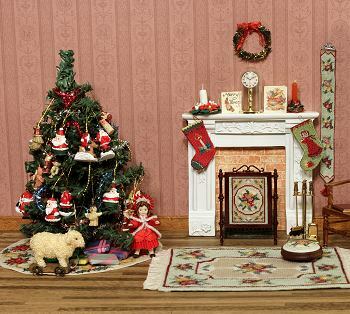 These Christmas tree mats make the perfect finishing touch to your Christmas scenes. They come in various diameters, so there’s bound to be one that’s suitable for any size of miniature Christmas tree. 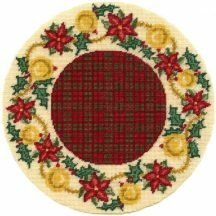 The kits come with a piece of 32 count silk gauze, colour block chart, plenty of Anchor stranded cotton (use one strand), detailed instructions and a suitable needle. 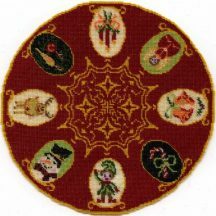 The mat is glued and the gauze cut right up to the stitching, instead of being hemmed, so a fabric glue such as Fray Check is recommended to complete this kit. 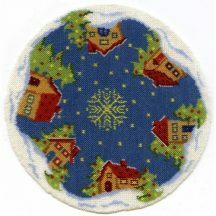 There is a Free Online Tutorial for the Christmas tree mat kits, which shows in detail how to stitch and assemble them.